I have a real love for historic hotels -- I love the charm, I love the details, the sqeaky doors, the rickety elevators. I just think they are charming, even if they might lack the luxirious comforts of a new 5-star hotel. 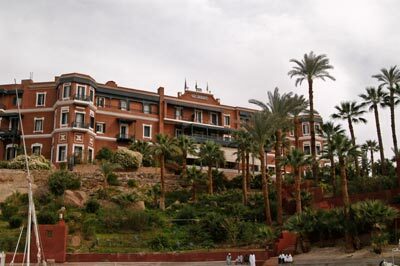 We definitely wanted to stay at the Old Cataract Hotel in Aswan, and the tour company tried to talk us out of it -- "The Aswan Oberoi si so much nicer [read newer] and..." Nope. GIve me a room with 12 foot ceilings and wood floors any day. We stayed in historic hotels inthe major cities -- The Mena House in Cairo, the Old Cataract in Aswan, the Old Winter Palace in Luxor, Salamlek Palace in Alexandria. In other cities, we were a bit more pedestrian, but part of our tour was the 5+ star accomodations, so it was a real treat for me.